Bobby Riggs defeated Welby Van Horn in the final at Forest Hills in 1939. Bobby Riggs came to Forest Hills in 1939 as the Wimbledon champion. As the top seed, the U.S. Championship was his for the taking. Bobby roared through his half of the draw, dropping two sets en route to the final. Meanwhile in the bottom half, a hot newcomer had emerged over the summer: Welby Van Horn. 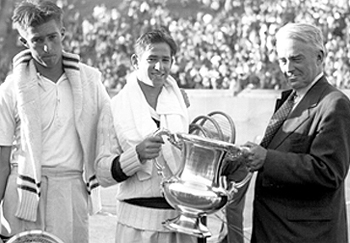 The youth's thundering serve and powerful volleys were drawing inevitable comparisons to Ellsworth Vines and Don Budge. Despite fans' hopes for a new young gun to take the place of Budge, in the final Bobby had the answers to Van Horn's power. Van Horn's cannonball serves seemed to come back harder than they were delivered. When Van Horn rushed the net, Bobby passed him, and when Van Horn hung back Bobby came in on the attack.